Barbed tape or razor wire is a mesh of metal strips with sharp edges whose purpose is to prevent passage by humans. The term "razor wire", through long usage, has generally been used to describe barbed tape products. While razor wire is much sharper than the standard barbed wire, it is named after its appearance, but is not actually razor sharp. However, the points are very sharp and made to rip and grab onto clothing and flesh. The multiple blades of a razor wire fence are designed to inflict serious cuts on anyone attempting to climb through and therefore have a strong psychological deterrent effect. Razor wire is used in many high-security applications because, while it could be circumvented relatively quickly by humans with tools, penetrating a razor wire barrier without tools is very slow and difficult, giving security forces more time to respond. Razor wire contains a core hardened steel strip that is often under tension, so if cut, the recoil could cause the wire to unfurl and lash out, striking the cutter. Starting in the late 1960s, barbed tape was typically found in prisons and secure mental hospitals, where the increased breaching time for a poorly equipped potential escapee was a definite advantage. Until the development of reinforced barbed tape in the early 1980s (and especially after the September 11, 2001 attacks), it was rarely used for military purposes or genuine high security facilities because, with the correct tools, it was easier to breach than barbed wire. Since then some military forces have replaced barbed wire with barbed tape for many applications, mainly because it is slightly lighter for the same effective coverage and it takes up very little space compared to barbed wire or reinforced barbed tape when stored on drums. More recently barbed tape has been used in more commercial and residential security applications. This is often primarily a visual deterrent since a well prepared burglar can breach barbed wire and barbed tape barriers in similar amounts of time, using simple techniques such as cutting the wire or throwing a piece of old carpet over its strands. Residential usage of barbed tape has been criticized by some as the aggressive appearance of the barbs is thought to detract from the appearance of a neighborhood. Due to its dangerous nature, razor wire/barbed tape and similar fencing/barrier materials is prohibited in some locales. Norway prohibits any barbed wire except in combination with other fencing, in order to protect domesticated animals from exposure. Some local jurisdictions further regulate or prohibit barbed wire altogether. 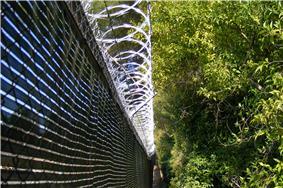 Razor-wire has a central strand of high tensile strength wire, and a steel tape punched into a shape with barbs. The steel tape is then cold-crimped tightly to the wire everywhere except for the barbs. Barbed tape is very similar, but has no central reinforcement wire. The process of combining the core wire with the steel tape was invented by the current owner of Razor Wire International, Renne Cano. The process of combining the two is called roll forming. 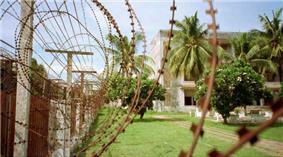 Like barbed wire, barbed tape is available as either straight wire or spiral concertina wire. Unlike barbed wire, which usually is available only as plain steel or galvanized, barbed tape is also manufactured in stainless steel, to prevent the points from rusting to bluntness. Typically the core wire is galvanized and the tape is stainless, although fully stainless barbed tape is used for expensive permanent installations or under water. Barbed tape is also characterized by the shape of the barbs. Although there are no formal definitions, typically short barb barbed tape has barbs from 10 mm to 15 mm long, medium barb tape has barbs 20 mm to 25 mm long, and long barb tape has barbs from 60 to 66 mm long. There does not seem to be much available research to indicate whether longer barbs are actually more effective in resisting penetration, but they provide a stronger psychological deterrent. Barbed wire became common in the American West in the 1870s and in World War I first found wide use in fortifications. Barbed tape was first manufactured by Germany during World War I, as an expedient measure during a shortage of wire. Since it was simply punched out of a rolled ribbon of steel tape, it could be manufactured much more quickly. This early barbed tape had triangular barbs and no reinforcing wire; consequently, it was more difficult to cut with ordinary wire cutters, easier to cut with shears, and was generally of lower tensile strength. From the early 1970s, unreinforced barbed tape was commonly used in perimeter barriers of US prisons. In the early 1980s, several manufacturers began offering barbed tape with an embedded reinforcing wire and the product has been the subject to a patent dispute. Early brand names of reinforced barbed tape included "Man Barrier" and "Razor Ribbon". The latter probably lent its name to the modern slang term.